Upton Town Library : Sign up for Read to a Dog at Upton Town Library: Every Tuesday in April, 4:00pm - 5:30pm! 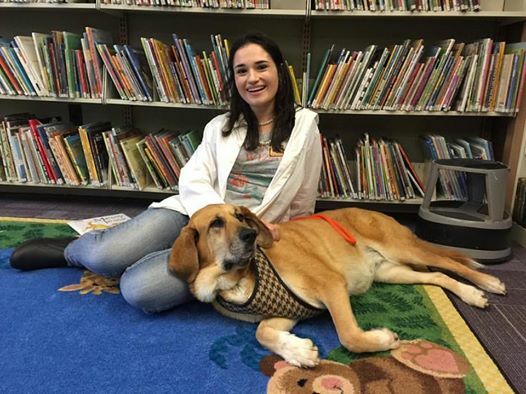 Sign up for Read to a Dog at Upton Town Library: Every Tuesday in April, 4:00pm - 5:30pm! WOOF! WOOF! Kids are invited to read to Honey, a local certified reading dog affiliated with Dog B.O.N.E.S. Therapy Dogs of Massachusetts, along with her human handler, Sarah Freeman, in tow. Beginning readers between the ages of 5 and up are welcome to register to let Honey listen to your child read, though younger early readers may be considered. Honey will sprawl on her favorite blanket in the Children's Area every Tuesday afternoon in April between 4:00pm and 5:30pm! There are six 15-minute slots between these times on each date; please register beforehand either in person, over the phone at 529-6272, or directly to Miss Nicole at nicole.uptonlibrary@gmail.com.